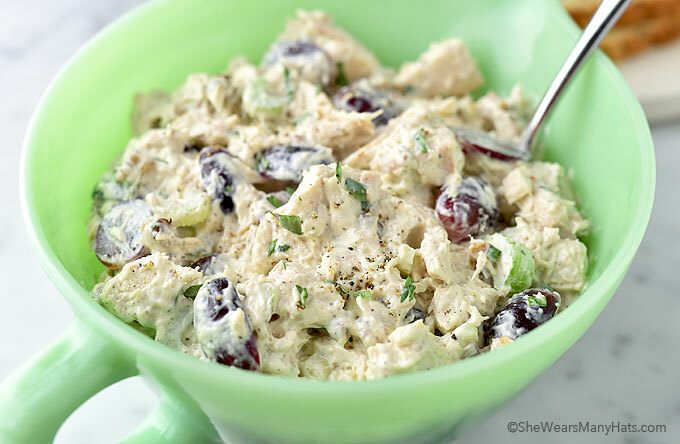 Tarragon Chicken Salad with roasted chicken, fresh tarragon, crunchy celery, grapes, and toasted pecans, all mixed together with a creamy mayonnaise base is chicken salad perfection. I’m so excited to share with you today! Not only am I sharing a fabulous Tarragon Chicken Salad Recipe, but also my best friend, Robyn from Add a Pinch, has a brand new cookbook: Add a Pinch: Easier, Faster, Fresher Southern Classics. And boy, oh boy is it full of all kinds of delicious recipes. This gorgeous book is packed with 100 delicious recipes from Starters and Snacks like Southern Cheese Crackers and Spinach and Artichoke-Stuffed Mushrooms, to savory Skillet Suppers like Coffee-Encrusted Prime Rib and Sam’s Oven-Fried Halibut, to Sweet Endings like Strawberry Shortcakes with Sweet Cream Cheese Biscuits and Georgia Peach Crisp to everything in between. All easy and approachable packaged in a beautiful book! Plus, throughout the book you will see bits and pieces of Robyn and her lovely family. There’s a reason I love to call her friend, she’s a true gem and her family too! Bart, Robyn and Sam have always felt like family. It’s funny how our kids sometime forget that we’re not related. But that’s how the Stones are. They simply pull you in and make you part of the family. If you’ve ever visited her blog, Add a Pinch, you know what I mean and her new cookbook is just an extension of that—a delicious, drool-inducing extension of that! Just check it out and I think you’ll see what I mean. 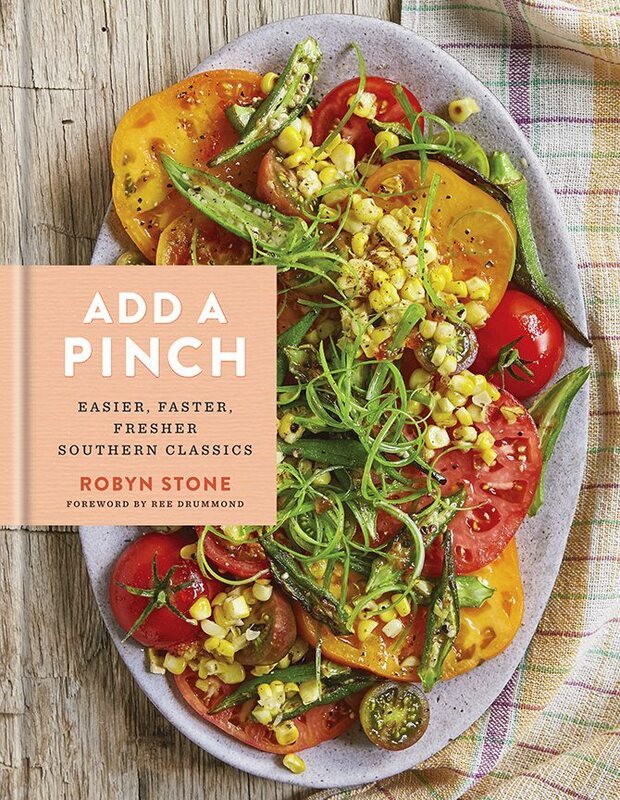 You will find Robyn’s book Add a Pinch: Easier, Faster, Fresher Southern Classics available at Amazon, Barnes & Noble, Indiebound, Walmart and Target. Another great thing Robyn has done for all of us in this new cookbook is to organize the recipes with different symbols to indicate whether it is a 10 ingredients or less, 30 minutes or less, freezer friendly, or able to be made in a slow cooker. At the top of each page you’ll find the handy dandy icons for each category. So clever! And it sure does make planning meals a bit easier, doesn’t it? And if you’re in a hurry and looking for recipes that take under 30 minutes, simply check the “Icon Index” in the back of the book for recipes that fall under that category. So smart! While I would love to share all kinds of recipes with you from Robyn’s book, it was so hard to decide what to make first. Plus, I had a craving for chicken salad. Actually Randy and I needed to prepare ahead for weekday lunches. Too often we get carried away with our work day that we get to lunchtime and are stuck scrambling to find something quick to eat so we can get back to work. Enter Robyn’s Tarragon Chicken Salad recipe. Robyn sure knows chicken salad, y’all! 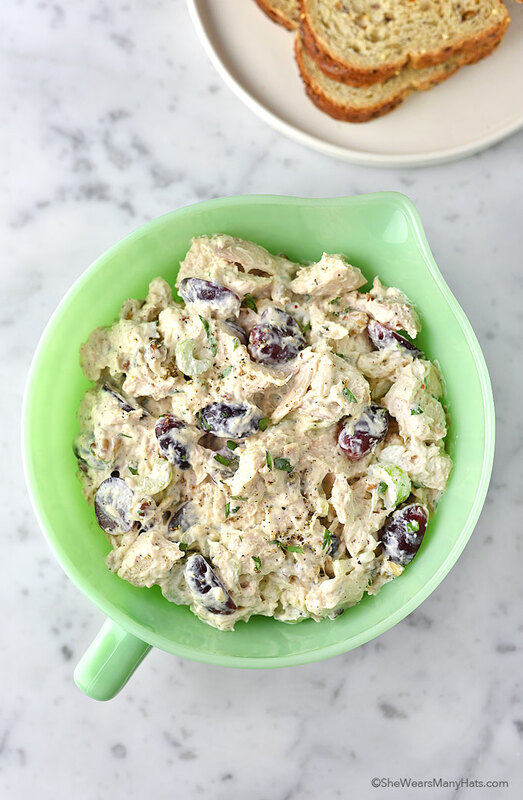 Roasted chicken, fresh tarragon, crunchy celery, grapes, and toasted pecans, are all mixed together with a creamy mayonnaise base. Just delicious! And so perfect for making ahead for lunchtime. Plus, it’s full of flavor and takes only a few minutes to put together. It sure was nice to have on hand ready to go for lunch and snacks. Tarragon Chicken Salad is tasty on toasted bread or in a lettuce cup for a tasty lettuce wrap. While the recipe calls for mayonnaise, plain greek yogurt may be substituted if needed. 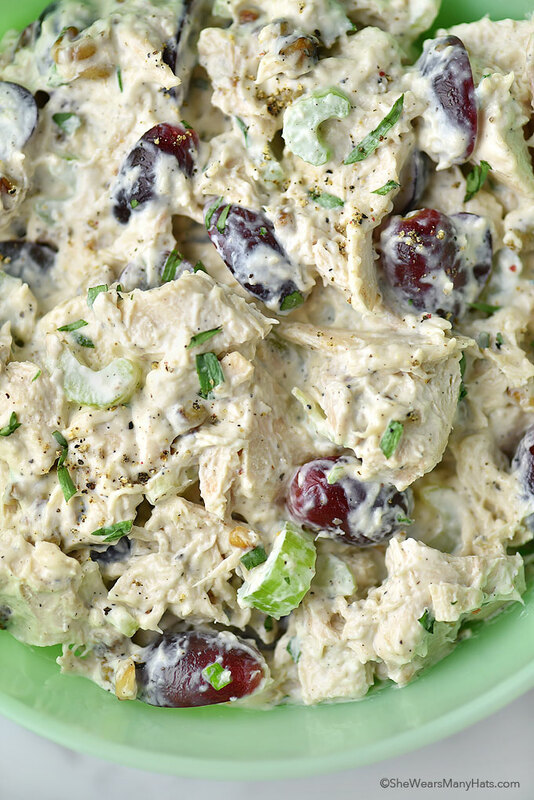 Another quick tip: a rotisserie chicken is excellent for this chicken salad. The only thing I’ll do different next time is to double (or triple) the recipe. Enjoy! 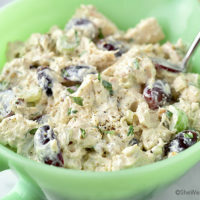 This easy chicken salad made with roasted chicken, fresh tarragon, crunchy celery, grapes, and toasted pecans, all mixed together with a creamy mayonnaise base is chicken salad perfection. Lightly spray a 6-quart slow cooker with oil. Arrange the chicken in the slow cooker, cover, and cook on high for 4 hours. Remove the chicken from the slow cooker (if desired, reserve any drippings for another dish–like soup!). Cut chicken into 1/2-inch cubes. Transfer chicken pieces to a large bowl. Add celery, grapes, and toasted pecans. In a small bowl or measuring cup, whisk together the mayonnaise, salt and pepper. Add to the chicken, grapes and toasted pecans. Stir to combine. Fold in fresh tarragon. 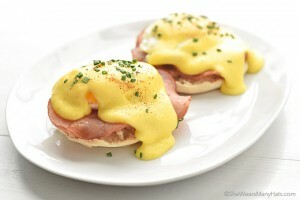 Cover and refrigerate until ready to serve, up to 3 days. *To cut cooking time, debone a rotisserie chicken from your local grocer or roast your own in 30 minutes using my easy Basic Roasted Chicken recipe. How lucky I am to have you as my friend! This is super sweet and means so much to me! I hope you and Randy enjoy the chicken salad and the other recipes you try! I can’t wait to hear what ya’ll think of them! Thanks again, my friend! Hugs to you!!! I made this recipe today using my Power Air Fryer Oven. I used 1/2 cup of of mayonaise and 1/2 cup plain Greek yogurt. It came out very delicious.